Two people were shot following an argument at the popular Palm Springs, Calif., gay bar this weekend. 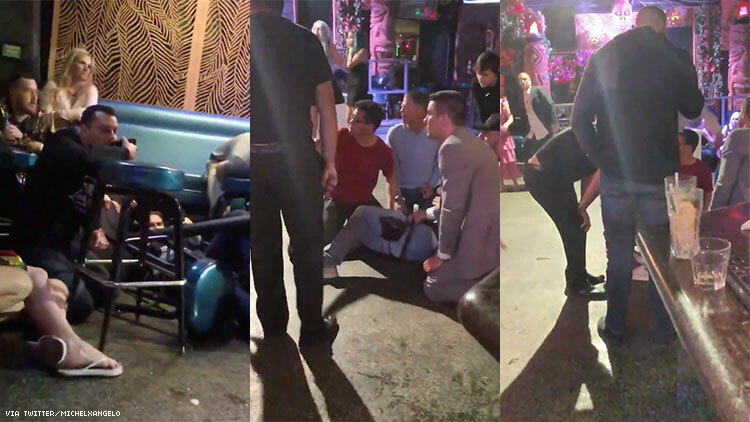 A video reveals that panic ensued and patrons took cover when shots were fired at a nightclub in Palm Springs, Calif., early Sunday morning. The shooting at Toucans Tiki Lounge occurred after two people who were arguing were removed from the club and two shots were fired in the parking lot, injuring two people, according to the Desert Sun. The shots fired hit one person in the parking lot and one person inside the club, according to police, who are looking for the suspect. The victims were both shot in their lower extremities. Neither suffered life-threatening injuries, reports TV station KESQ. Meanwhile, videos have circulated of panicked patrons inside the bar shouting and taking cover under tables. Witnesses described the alleged shooter who fled as a man in his 20s or 30s wearing a black hat, a black hoodie, black sweatpants, and had tattoos on his neck, according to the Desert Sun. "I was dumbfounded. I was shocked. You don’t think it’s going to happen in your own neighborhood, as we all often say," Toucans patron Steve Egan told KESQ.